Form guides were turn upside down last night in the Men’s doubles when national back-up bowlers from Selangor, Zaid Izlan Ibrahim Hakimi and Kelvin Keong won the gold medal upstaging the national bowlers. 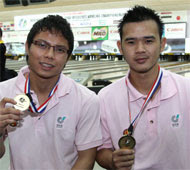 Zaid Izlan (left), the younger brother of Zandra Aziela, and Kelvin (right), amassed a total of 2,742 to win the gold. The silver and bronze medal too saw surprises as national youth bowler from Sarawak Aris Ardila Santosoh and Chong Jun Foo with their total of 2595 and Kuala Lumpur’s Yusuf Raos and Kua Jian Wen with 2546, picked up the medals respectively. National bowlers from Penang, Adrian Ang and Aaron Kong, led from the start of the six games till the fifth, but dropped to sixth for the final, when Aaron had a disastrous 140 in that game as compared to Adrian’s 223. Aaron picked up himself for the final game with a 213 while Adrian fired 223, but their grand total of 2546, could only see them finish fourth. Another national pair, from Selangor – Zulmazran Zulklfi and Alex Liew – were also expected to do well, especially after the former was in sizzling form when he won the singles gold medal on Monday. But Zulmazran who fired a high total of 1617 in the singles, could only muster 1217 last night. Together with Alex’s total of 1192, their total of 2409, could only place them seventh. However, the consolation for Selangor was that while Zulmazran and Alex could not deliver, their other pair – Zaid and Kelvin – delivered and put them on top of the medal tally with four gold medals from eight events in the last two days. As for Zulmazaran, his consolation was that he was still the leader in the All-Events with his total of 2843, closely tailed by Adrian (2745) and national bowler from KL Syafiq Ridhwan in third spot with his total of 2699. A keen tussle for the overall champion is expected in the final day of the Interstate championship today, as teams’ battle in the team events and All-Events. Kuala Lumpur, who have three gold medals, are expected to give their neighbours a run for their money. (Footnote: Earlier in women’s doubles, Zandra Aziela and Siti Safiyah had set a new record with their total of 2673 surpassing the previous record of 2526 set by Lydia Kwah and Sarah Yap from Selangor in 1996.